owning a hot tub- Sunny's Pools & More! Hot tubs are a great way to enhance your backyard. They’re not only an excellent source of relaxation, but they are also very affordable and easy to transport. One of the biggest advantages that hot tubs have to offer are countless benefits to improve your overall health. Let’s dive in to see the many reasons as to why hot tubs are a “must-have” and why owning a hot tub is awesome! Mental Benefits-hot tubs can help calm nerves and alleviate stress. It also can be used as a mood elevator. As soon as you step foot into the hot tub, it’s almost as if your mind can naturally free itself from its regular day-to-day worries. Musculoskeletal Benefits-immersing in a hot tub works wonders on a person’s body. It reduces the pressure from your joints and relieves pain. Having jets in your hot tub helps to improve circulation and lessens swelling and inflammation. Sleep Benefits-if you have difficulty sleeping, soaking yourself in a hot tub can help you significantly. It turns out that soaking yourself can force your body to cool down–thus allowing for your body to sleep comfortably throughout the night. 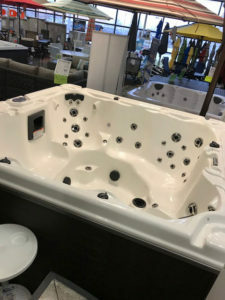 Looking to buy a hot tub? Our Viking Hot Tub is one of our best sellers and has been in the hot tub business for over 25 years. Viking spas offer some of the most advanced features in the spa industry. In fact, a few features that we include are LED lighting, stainless steel jets, and stereos. Interested in purchasing one of our hot tubs with chemicals and accessories? Give us a call or contact us today! Sunny’s Pools & More Macomb Has A New Home! Receive great deals and savings all year long!